Future of Charity: I am a Rebel. 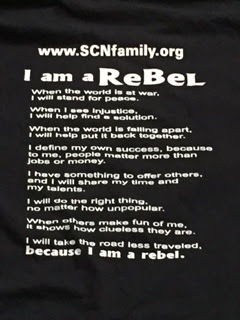 A little while ago I was in a grocery store wearing an SCN REBEL T-shirt and a woman behind me in line commented on it. She said the larger caption, "I am a Rebel," caught her attention and she was intrigued by the rest of the message. She explained that she had been a high school teacher in an inner city school in Philadelphia for many years and her experience of a rebel was a student who challenged any semblance of authority and didn't like to follow rules. I smiled at her, remembering my experiences of working with street kids and vulnerable youth. I told her I could appreciate how her image of a rebel had been formed but suggested that there are other, more mature and socially conscious ways to be a rebel. I went on to tell her that I was a Sister of Charity of Nazareth and these are values we embrace. This encounter helped me in two ways. First, it reminded me of the power of language and the importance of communicating the meaning behind our words and how our own experiences shape us and lead to certain understandings and assumptions. 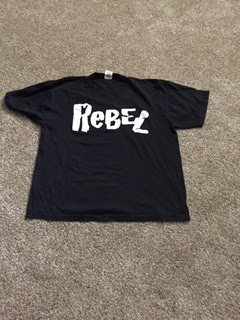 Secondly, it challenged me to be mindful every day to choose to be a rebel. The T-shirt is cool and it made for a good conversation piece; however, I am being called to act for justice, to share my time and talents, to live simply, to work for peace, and to do the right thing. OUR WORLD NEEDS REBELS. Are you a rebel? If yes, how?